The above image was made back in May, after I’d already covered the first college graduation of the season, as well as another local assignment. I remember PD units speeding by me as I was on my way home to edit and ditch the khakis, pressed button down oxford sans tie, when I happened to spot the spiraling smoke on the horizon, down on the river. I hustled down to the riverfront marina and made a few images with the 300mm and a 2X tele-extender on the Canon 5D-MK II, hand-held mind you, from the city boat launch. (That’d be the equivalent of a 600mm, f/5.6 for those of you keeping score at home.) Nothing wrong with that combination in full sun, just as I routinely now use this combination for outdoor sports when shooting “extra” long… ~ cg. This entry was posted on Wednesday, July 25th, 2012 at 10:24 PM. 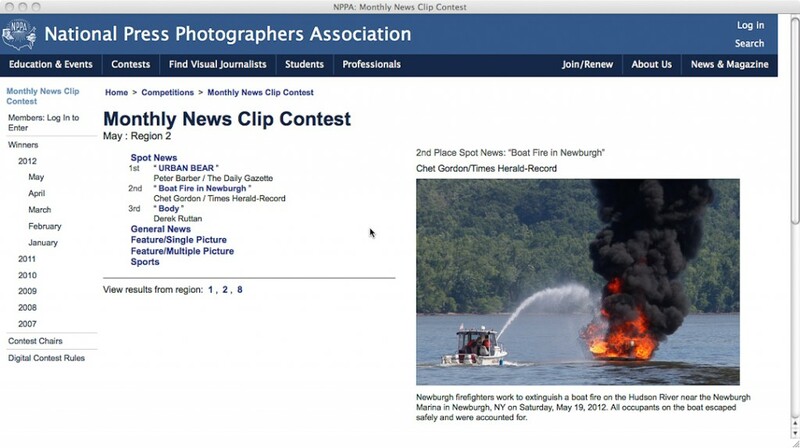 It is filed under Assignments: and tagged with firefighter, newburgh. You can follow any responses to this entry through the RSS 2.0 feed.